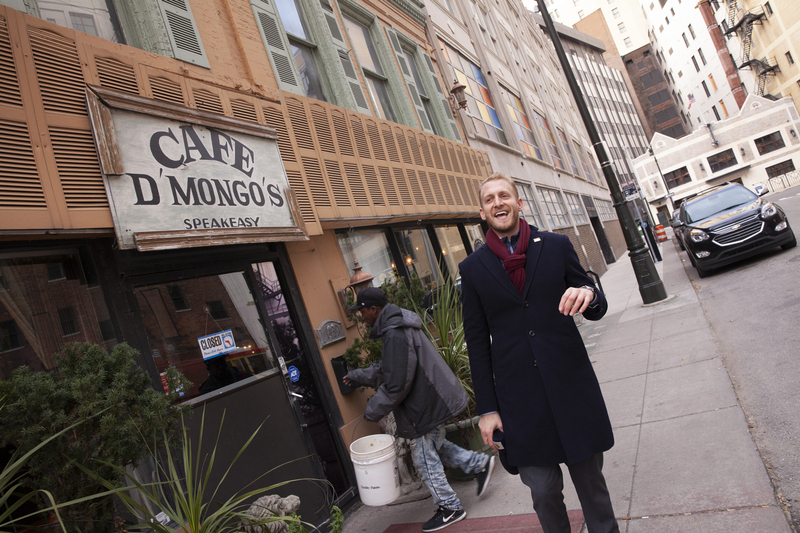 Talk about the perfect spot to meet up with NEXTGen Detroiter, George Roberts: it’s everywhere . . . in the office buildings, lofts, coffee shops, hot spots and streets of the city, on the bike lanes of his commute from Woodbridge, in the synagogues and Chabad of Greater Downtown Detroit, at his monthly “Whiskey Club” organized by The Well, in the halls of Federation – literally and virtually, everywhere you go, you’ll find George at work and at play. Park professional by day, community connector in every spare moment, networking and generously giving of his talents and energy, George returned to his hometown of Detroit from New York three years ago to join the Quicken Loans Community Fund which leads the Quicken Loans Family of Companies philanthropic strategy. 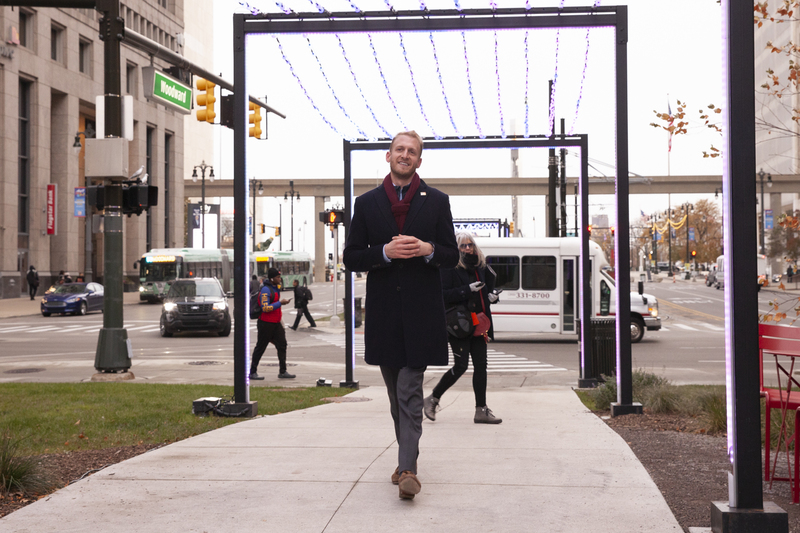 As Director of Public Spaces, he oversees investments in the redevelopment, management, programming and operation of parks, plazas and other public spaces in and around the Detroit downtown area. Bedrock’s real estate holdings include about 100 properties. 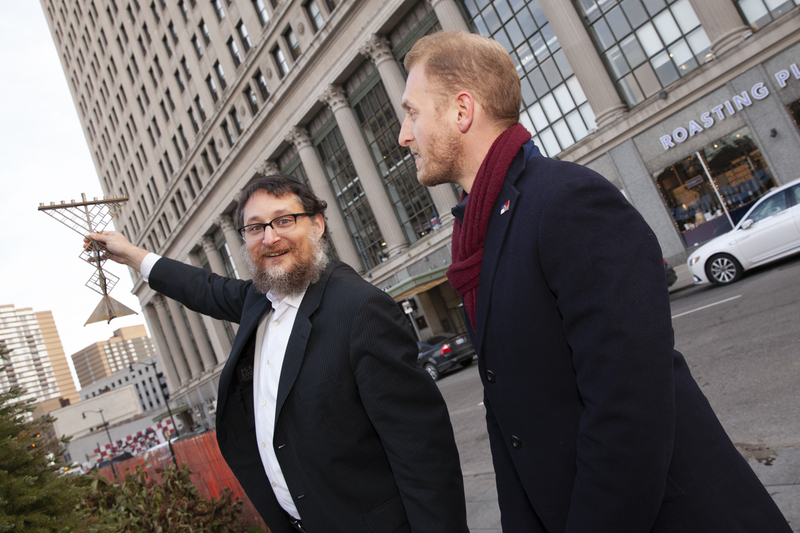 The Quicken Loans Family of Companies has committed more than $5.6 billion to acquire and develop more than 100 properties in downtown Detroit and given more than $150 million to Detroit-based community organizations and programming since 2010. 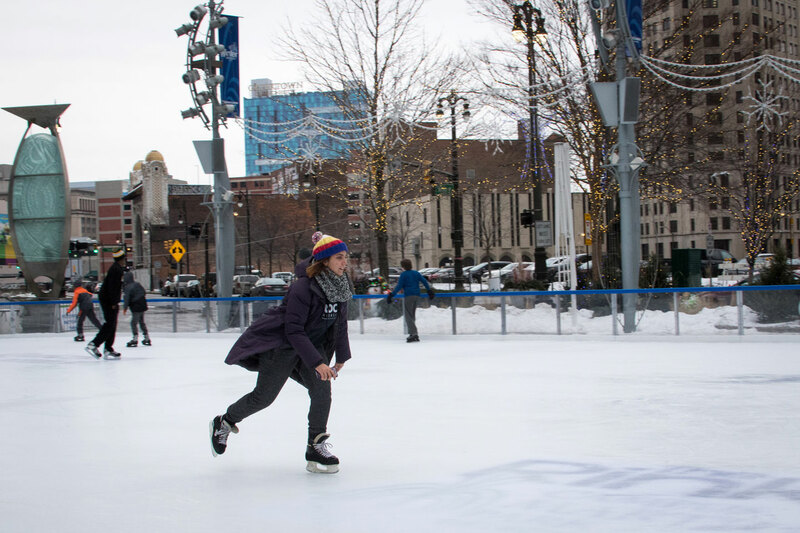 The city’s largest private employer, the Quicken Loans Family of Companies has about 17,000 team members – many of whom not only work, shop and dine downtown, but also live and play downtown. Count on George for networking, setting the tone and manner for “chance” meetings – or pleasant surprises – hitting the sweet spot between business and entertainment. By his invitation on a late afternoon in November, we meet George in the hotel lobby of The Siren 1509 Broadway Street. 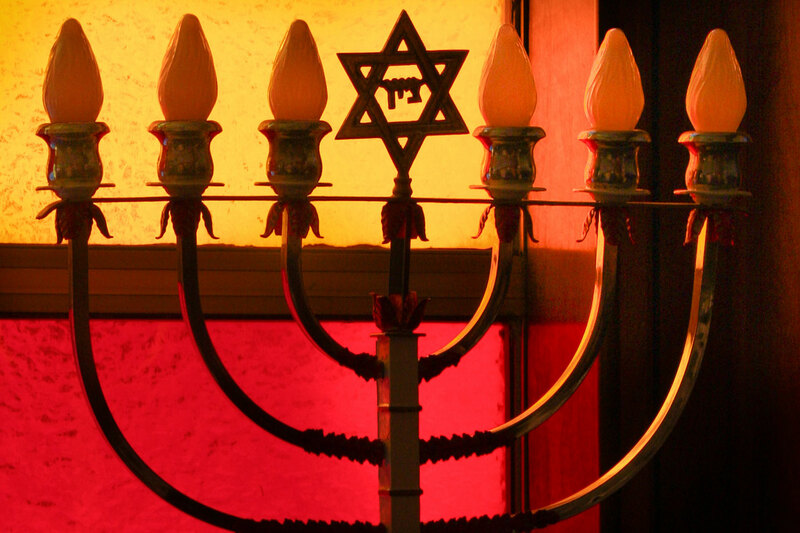 It’s no coincidence that we meet George sitting in lobby of The Siren with Jess Katz – career coach, consultant of Reboot and heading for a Fellowship program with the American Jewish Joint Distribution Committee (JDC). 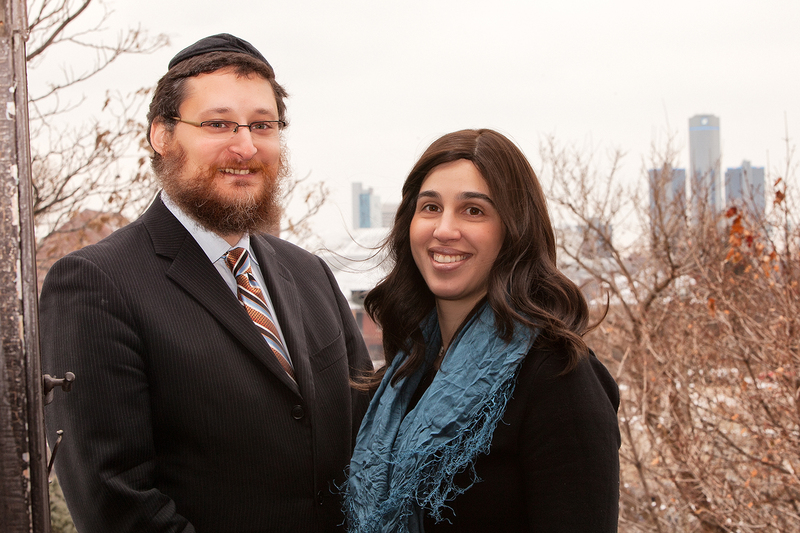 “Jess has been my guide to Jewish Detroit and a mentor to me in a big way,” says George, as he enumerates the ways she has led him to his various community service roles. 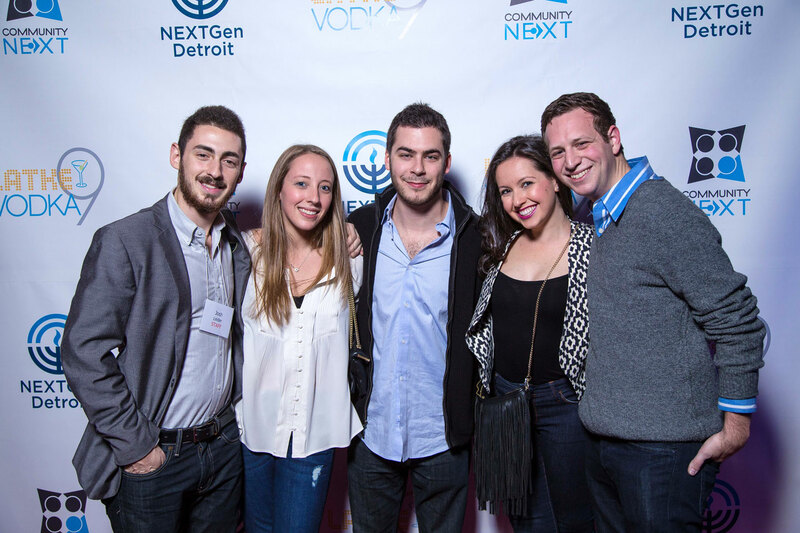 Currently, George is on the Executive Board of NEXTGen Detroit, focusing on attracting and engaging young adults in the NEXTGen/Federation world. Additionally, George serves on the Board of The Well and as V.P. of Programming of the Founders Junior Council of the Detroit Institute of Arts. 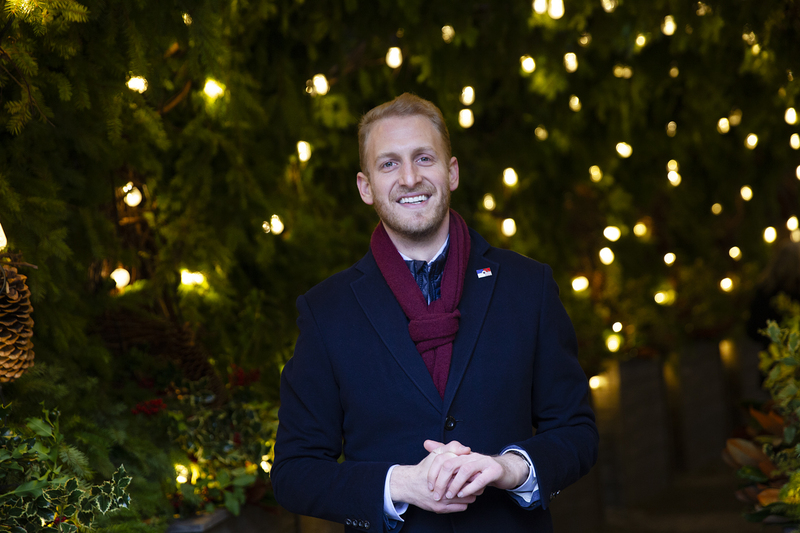 A rising star with a passion for Israel, George is a past participant in Federation’s Becker-Marcus All-Star Leadership Mission and a Co-Founder of Federation’s Israel Engagement Committee; additionally, in 2018, he participated in the prestigious ROI Global Summit in Jerusalem. On the Board of the Roosevelt Park Partnership, George is currently working on the redevelopment of the park in front of Michigan Central, now owned by the Ford Motor Company. For our walk in the parks, we luck out with a break in the weather. It’s a sunny afternoon – ideal for a stroll across John R. towards Capitol Park. “This is part of my ride from Woodbridge every morning,” George explains, mentioning that he is a “functional” cyclist and the proud owner of a Detroit Bikes C-Type. Stopping at the intersection of Farmer and John R., we have a snapshot of cranes in the skyline, new hotels on the rise . . . and the holidays soon to light up the streets. If you ask George, the experience of shopping on Woodward Avenue this winter is more exciting than it has been in many years. There’s lots in store for holiday shoppers looking for local artists, makers, entrepreneurs and a cool experience at 1441 Woodward Collective – and 1520 Woodward, where Detroit artist Lisa Spindler has her studio. 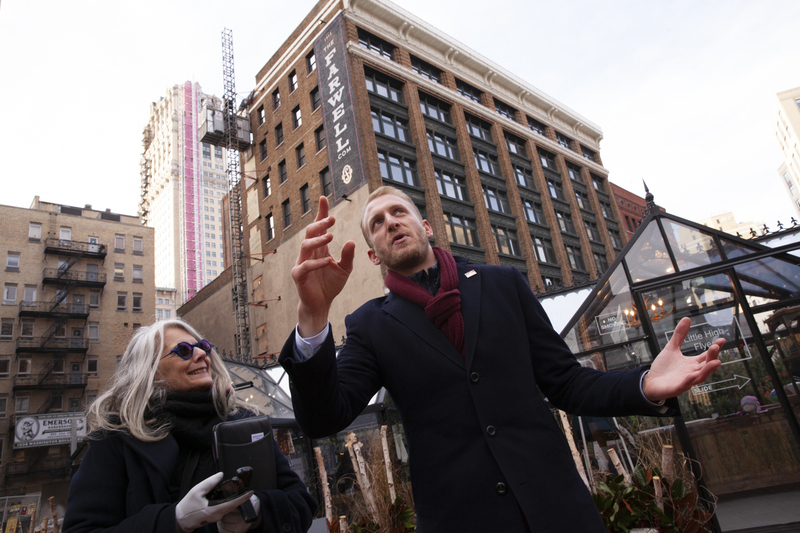 A stroll past WeWork Merchant’s Row will take you to John Varvatos, Detroit is the New Black, House of Pure Vin, Bonobos, Warby Parker , Under Armour and Nike among many others. 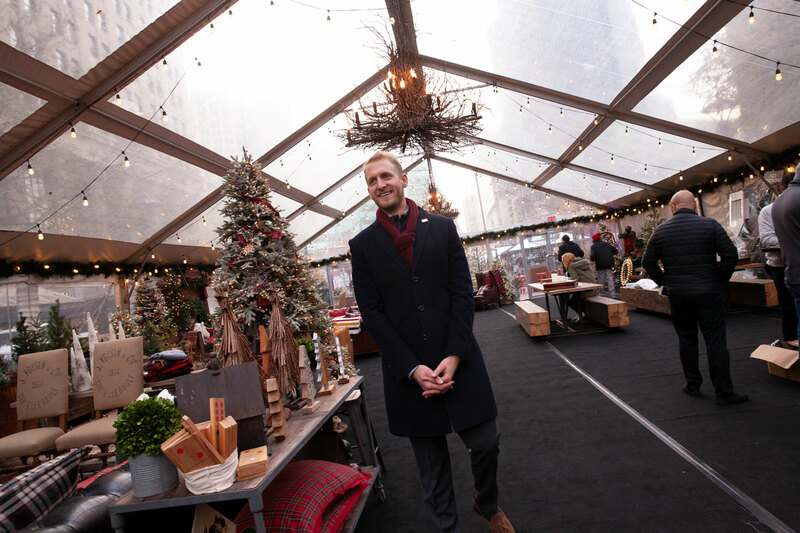 New on Woodward Avenue this holiday season is the Shinola Hotel featuring the clothing stores, Good Neighbor and Madewell, and new stores from Shinola and Drought. “Capitol Park is special to me,” says George. 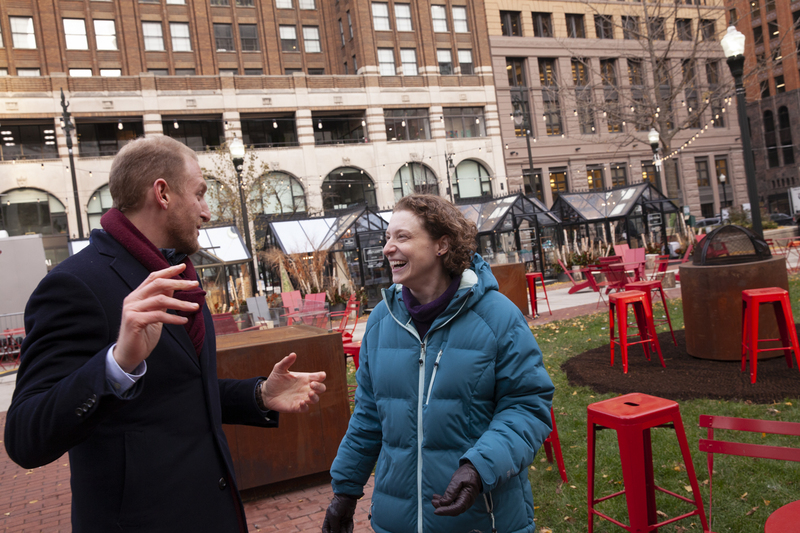 “Developing Capitol Park is a project that allows me to bring together my professional life, my personal life and communal life. Sukkah by Detroit is a perfect example of an astonishing success;working with friends and partners from Bedrock and the Quicken Loans Community Fund, the Downtown Synagogue, The Well, Federation’s NEXTGen Detroit, Hazon Detroit, Chabad and Hillel of Metro Detroit, we created an innovative Jewish community project to activate a downtown public space, thanks to the generous support of the William Davidson Foundation. 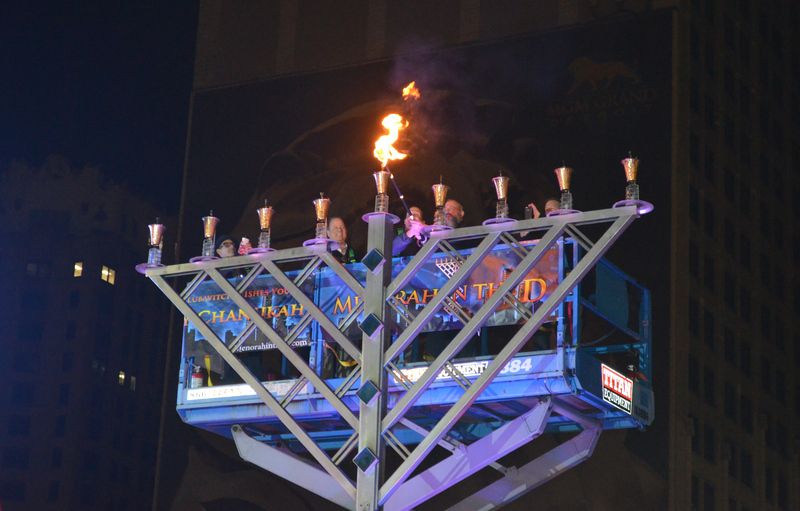 Towering above the Holiday Market shops and the festive scenery of Cadillac Square, a 26-foot Menorah stands as the centerpiece of 8th Annual Lighting Ceremony, hosted on December 2nd by The Shul Chabad-Lubavitch of West Bloomfield, in partnership with the Jewish Federation, Chabad of Greater Detroit, Quicken Loans, Bedrock and other supporters. 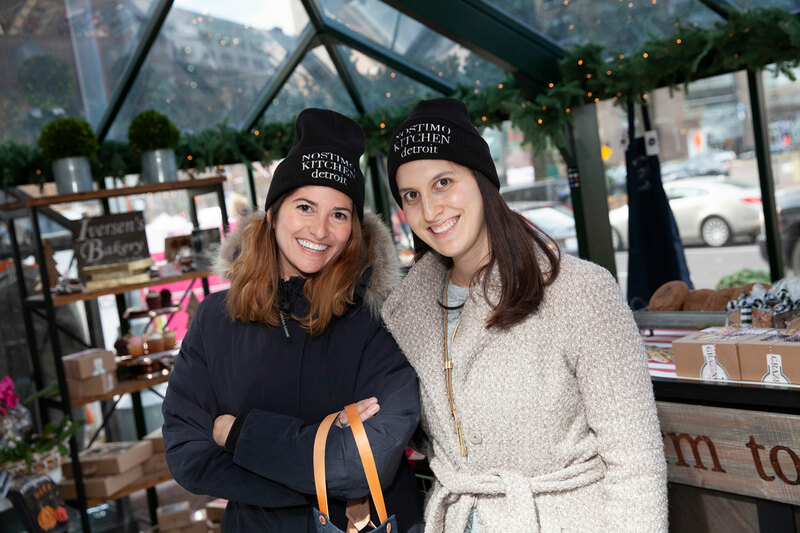 Beyond adding a new level of entertainment to the shopping experience, the Cadillac Square Market offers a pipeline for start-up retailers and businesses seeking to open a brick-and-mortar in a Bedrock building or other space around the city of Detroit. New and returning ventures this year include 248 Studio, Ashley Gold, Beirut Souk, Nostimo Kitchen to name a few. A family-friendly retreat for shoppers, Cadillac Lodge beckons with comfy couches and plenty of room to sit, eat and drink indoors, with nearby Parc restaurant leading the menu offerings. Just warming up, in the family-friendly Cadillac Lodge, all set for drink and food service provided by the nearby Parc. Networking by chance meeting? George stops to chat with Ryan Landau, tech-driven entrepreneur, founder of re:purpose (an online recruiting marketplace) and President of Federation’s NEXTGen. Young Detroit: Then & Now.